"I'm sorry. I'm very sorry. Sometimes I just don't know what the hell I'm doing." There's a kind of existential dread at the heart of every film noir�they all take place in that dark and brooding world in which no good deed goes unpunished, and you're thankful that there's style to burn, because it and everything else are going to go up in flames by the time we get to the final fadeout. 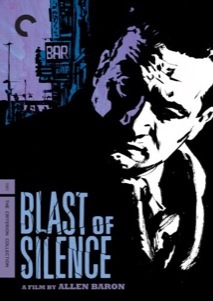 But Allen Baron's Blast of Silence may be the most self-conscious of the sort, playing out almost like a mob version of Camus's The Stranger. It's a strange and energetic movie that runs like the wind, and you just wish that it would trust itself a little bit more. Allen Baron is the screenwriter, director and leading man, playing Frankie Bono, a Cleveland hit man in New York for Christmas week not simply to look at the tree in Rockefeller Center, but to take care of a job. The main contours of the story are pretty straightforward, actually�Frankie gets the job, assembles the necessary tools, and finishes the contract with ruthless efficiency and extreme prejudice. He gets waylaid by old times, though�numbing himself with a couple of beers in an upscale bar, Frankie runs into an old school chum who insists that Frankie join them for Christmas Eve dinner, and it doesn't hurt that the guy's sister, Lori (Molly McCarthy), is obviously one of Frankie's old flames. The movie was shot on location, and it brings back a New York that most of us know only from the movies, a city of lunch counters and boot blacks, of automats and men in hats, and Frankie fires through this world, God's lonely man, trying to remain incognito as he stalks his prey and not get entwined in the messiness of the past. (In a funny way, he's an obvious antecedent to Travis Bickle, but given its period and the storyline, emotionally he's closer to Fast Eddie Felson.) And even though it's relatively sparse, the supporting characters are terrifically etched and strange little portraits too�especially Larry Tucker as Big Ralph, the hulking firearms middleman who keeps pet rats, never a good sign in a world in which a guy is only as good as his word. What gets rather too distracting is that the movie is wallpapered with voice-over, either Frankie's interior monologue or the dime-store novel that the character imagines himself starring in. It's delivered by Lionel Stander, whose gravelly voice matches the hardened exterior of the protagonist�but it's just so relentless and overwrought, tarting up just about every scene ("The conga drum beating your head until you taste the hate on your tongue," and so on), that it starts to leech the drama out of Frankie's story. You can understand the inclination�the lead character is so fierce about keeping his own counsel, and you almost sense that Baron trusts himself more behind the camera than in front of it. But at some point you want to holler back�enough already! Baron actually figures that out by the end of the run of the picture, which is a blessing, even if a bit too late. Image Transfer Review: Very good transfer, especially considering it's a low-budget picture shot almost fifty years ago now. Some of the grays have gone a little muddy, but overall this is strong, sharp stuff. Audio Transfer Review: Stander's voiceovers are pumped in at a mighty high volume; they occasionally help to mask a fair amount of ambient noise, something you'd expect from a monaural track of the period. The locations get revisited yet again in 2008 for an accompanying photo gallery, which provides us with then-and-now comparisons; much more evocative are Polaroids snapped on the set of the film. Terrence Rafferty contributes an essay on the movie for the accompanying booklet, and best of all is a four-page graphic novel incarnation of Baron's story, by Sean Phillips. Rescued from relative obscurity, the movie chugs along with the cheap propulsive energy of the best early Samuel Fuller pictures, like The Naked Kiss, and offers a window into the past of New York City that no film made on a backlot ever could.